My brother is a hard one to catch – rarely has his phone with him, doesn’t spend much time on the internet so his facebook profile doesn’t get a lot of use. So when I caught up with him and his lovely girlfriend at a family get together a few weeks back I seized the moment and the stars aligned and we worked out we were both free the coming Friday so I invited them around for dinner. 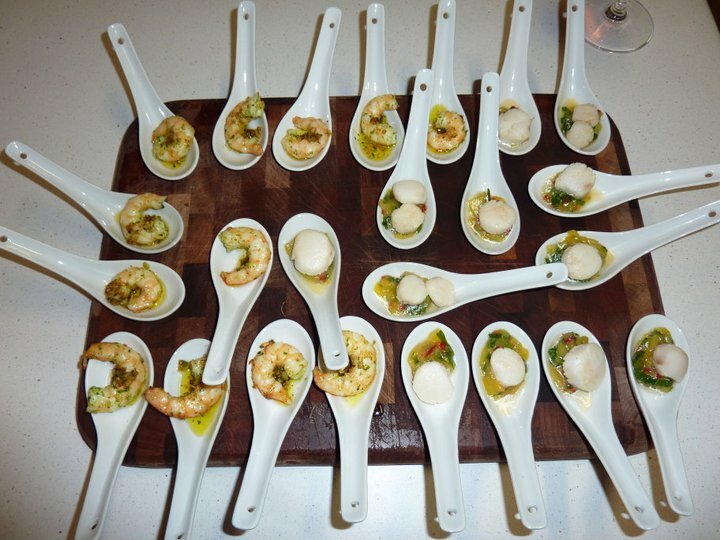 I seize any opportunity to use my Chinese spoons these days so I decided I’d go with the usual prawn and scallop combination that I went for when GG and I had our parents around a few months back (http://perthmunchkin.com/2011/03/26/garlic-and-chive-butter-prawns-and-mango-lime-mint-and-chilli-salsa-scallops/). And they were well received so that’s always a plus. Slightly harder to find fresh mangoes in Autumn so I gave canned slices a go and they weren’t half bad. 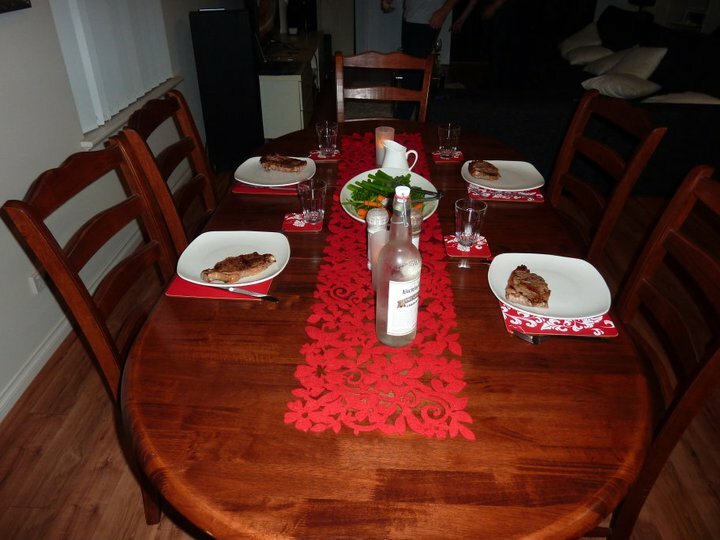 Then for mains, I bought some porterhouse steaks for the butcher at Mirrabooka Square and we fried those up and I made a creamy brandy and pepper sauce…. yes perhaps this was just so I had another chance to set a pan of brandy fumes on fire… it amazes me to watch how quickly the alcohol burns off, while looking so spectacular! So with the steaks we served brocollini and also some super cute baby carrots, which I managed to track down at Woolworths with their tops on. So just trimmed those up and they present really well. An added bit of colour. Then for dessert I had another go at churros – with a baileys white chocolate and dark rum dark chocolate dipping sauce. 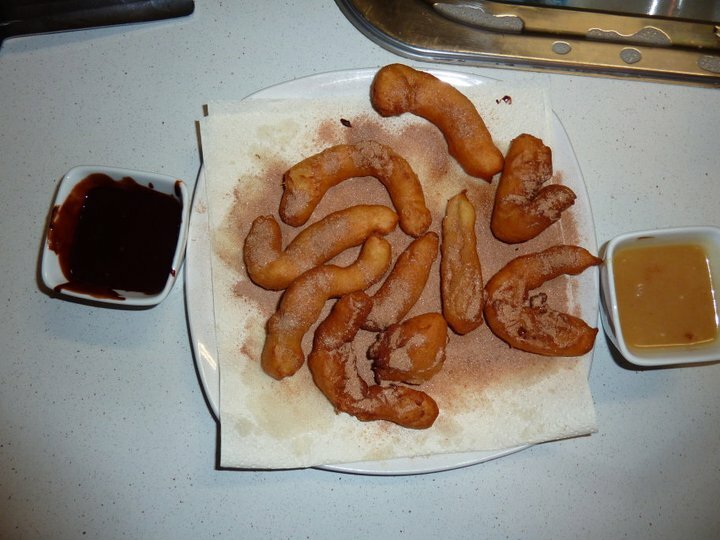 (http://www.taste.com.au/recipes/2469/churros+con+chocolate). They don’t turn out looking very pretty when I make them….. a learning curve perhaps. It is a pretty easy recipe but given that they are deep fried, sadly they probably are only a sometimes food, despite the fact I think I could enjoy them most days given the opportunity. So it was another enjoyable night in with some lovely people around. Always nice to have a chat over some food and I like any opportunity to sharpen up my cooking skills. Practise practise practise.